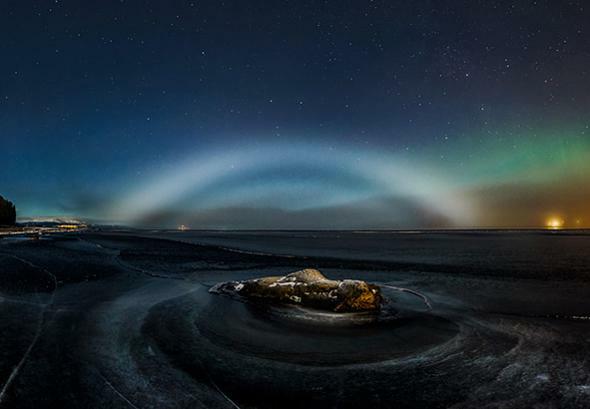 Göran Strand photo of a very rare lunar fogbow. The eerie and lovely sight of a lunar fogbow over Sweden. Göran Strand is an amazing astrophotographer whose work I’ve highlighted here many times. He has an astonishing skill in making beautiful photographs out of rare and bizarre phenomena. And here he is once again: That photo above shows that’s quite uncommon sigh: a fogbow! But this being Strand, even that’s not unusual enough. For him, it had to be even more difficult to track down. That’s not just a fogbow, it’s a lunar fogbow! Fogbows are similar to rainbows, in that they’re caused by water droplets, but in detail they’re very different. In a rainbow, sunlight is bent and reflected inside a raindrop, and sent off at an angle. The drops are big compared to the wavelength of light, so they act a bit like mirrors. Each color of sunlight, though, bends at a slightly different angle, separating them, creating the multihued rainbow. Fog is made of much tinier droplets, far smaller than a millimeter in size. At those sizes, the physics is different. Instead of following clean paths, the different colors of light get smeared out inside the droplets due to a process called diffraction — this is what happens when a wave encounters an obstacle; it spreads out. When the colors emerge from inside the teeny fog droplets they overlap so much that they form white light. Fogbows are generally pretty faint, and usually seen only dimly during the day. The Moon is far dimmer than the Sun, but —and stop me if this is too much— it gets darker at night, so the Moon is enough to create a visible fogbow. Even then, it helps when the Moon is full or nearly so, to maximize its brightness. 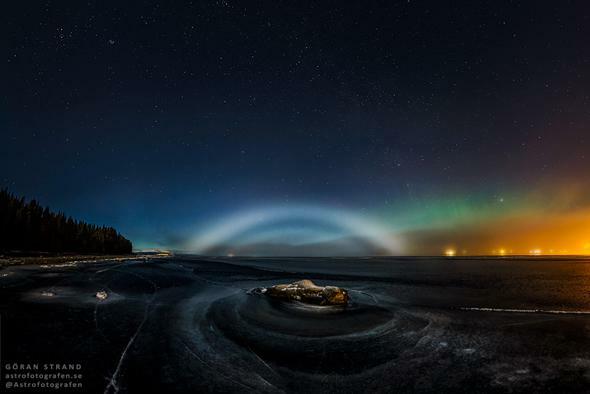 The original shot shows the fogbow, stars, the aurora, and glow from a nearby town (I cropped the shot at the top of the article to emphasize the fogbow). Strand took the fogbow picture on the island of Frösön in central Sweden on Dec. 17, 2016, when the Moon was about 85 percent full. He actually went out to photograph the aurora, which didn’t perform well that night. He was about to go home when he decided to go to another site to see if he could get a better shot. To his delight, he saw the lunar fogbow while walking along the beach. Good thing he did; a few minutes later the wind dispersed it! He’d been hoping for years to see and photograph one, and now his wait is over. I’m really glad it is! It’s a spectacular photo. You can even see supernumerary arcs (caused by wave interference inside the drops) and the green aurora, weak as it was (the yellow glow is from a nearby town). I had to do a little reading to understand what causes these milky bows, and now that I understand them better I too want to see one! Fog is rare in my part of Colorado, and I’d need a clear night with a mostly full Moon as well, so there’s a lot of moving parts to connect. Still, I know how to maximize my odds: Be aware of my environment, and keep looking up! There is beauty waiting around those who endeavor to see it.